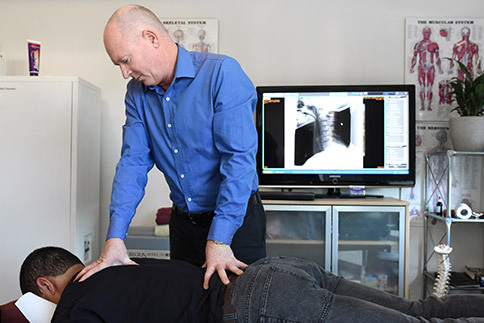 Our chiropractor Dr Luke Hennessy offers a wide variety of specialised chiropractic adjustment methods for patients of all ages. Whether you’re seeking care for yourself, a grandparent or a child, we’re confident in our abilities to help you feel better and heal better. Helensvale Chiropractor Dr Hennessy believes in looking at your injuries from a biomechanical standpoint to improve your function naturally. Best of all, your care is completely tailored to your specific needs—we know that each patient is different, and your body deserves care that is designed specifically for your needs. Diversified: After identifying which vertebrae have lost their normal motion or position, a specific manual thrust is applied to free up “stuck” spinal joints. Activator Method: This is a system of spinal evaluation combined with a handheld adjusting instrument that delivers a consistent, low-force thrust. AK Applied Kinesiology: Testing the strength of specific muscles of your body helps us find the structural, chemical and mental problems and monitor your results. Thompson: Thompson Terminal Point is a system of analysis and a special table that reduces the amount of energy needed to adjust your spine. Gonstead: This full spine approach relies on X-rays and a heat-sensing instrument for a thorough evaluation and documented results. Chiropractic Ecology: A holistic approach to health which includes treatment and advice in both chiropractic adjustments and diet. Massage: Our team is trained in massage and soft tissue techniques to help alleviate pain and muscle spasm that may accompany spinal conditions. Cranio Sacral Therapy: A gentle method of correcting affects which stress, trauma and illness may have upon your brain or central nervous system. For patients who may be nervous or not like the idea of having their neck adjusted manually, we’re pleased to offer the Activator Method, a technique that uses a handheld tool to gently manipulate your spine into alignment. This is often a great method for children as there is no pain or popping sound that occurs. Our team would love to speak with you about how we can help your family experience optimal health with natural chiropractic care. Call today to get started!